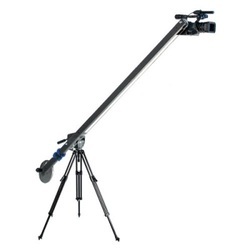 Tripod and counterweights are not included. From the ground level, the camera can be tilted up over 90 degrees. Shooting from the ground up gives you incredible perspective when shooting trees, buildings or people to show how tall things really are. From over the top, the CobraCrane I offers a tilt down perspective capturing the “larger than life” shots. The over the top shot is ideal for cooking and food marketing videos. CobraCrane I also offers a framing mode where the subject stays framed while the camera is boomed up and down. CobraCrane I works with our Extension Kit 1 (included in this kit) adding three-feet to your five-foot crane. When used in with the extension, CobraCrane I can reach up to 11 feet high. The ease and flexibility will make this system one of the most popular tools in your toolbox. Combined with one of our dollies, the CobraCrane I offers users a combination of swings, booms, tilts, rolls and dolly moves. Incredible shots are simple to create and master in minutes.